As I mentioned before, I use my Panasonic SD-BMS 105T bread machine quite a lot; but mostly for basic breads (such as white and whole wheat, or with simple additions of dried fruits) I made a cheesecake once, but other than that brave venture, I haven’t really tried anything too groundbreaking with this machine. The main reason is that I can’t read the Chinese instructions very well, so I didn’t want to take the risk of wasting a lot of ingredients on something that wasn’t going to turn out properly. I’m so grateful to all my readers who have tried to help me out with finding English translations of the manual for this machine. Most recently, Jeffrey came to my rescue. His family had just purchased a similar bread machine model, and theirs came with an English version of the manual. Jeffrey kindly gave me a copy of the manual, and so I decided to try to make a bread with more complicated steps to celebrate. 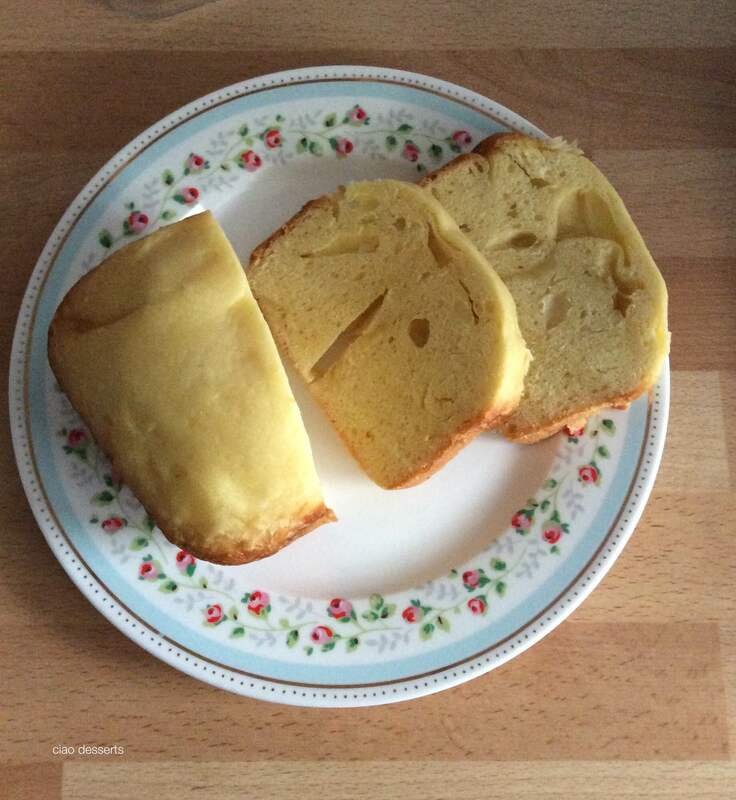 Brioche is different than the breads that I usually make in my bread maker; it contains eggs and quite more butter. But those are ingredients that give brioche its fluffy texture and buttery taste, so I thought it would be worth a try to make it. 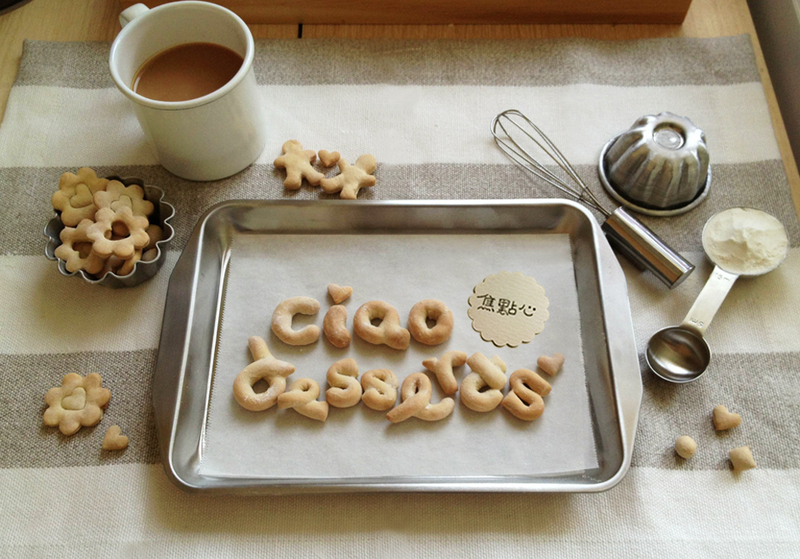 The English version of the recipe is really helpful to have, but it still needs some tweaking. First, the measurements seem different than for my machine, and some of the terminology is a bit strange. For example, the recipe calls for “evenly mixed eggs,” which was a bit confusing at first glance. Another slightly wonky translation is for “saltless butters,” which is more commonly known as unsalted butter. Also, some of the translations are a bit on the dramatic side; for instance one sentence read: “the bread may be deformed upon over exertion.” Henceforth, beware. Do not over exert your bread. Note: Before you begin, you must cut up 40 grams of butter into small pieces and freeze for at least 10 hours. 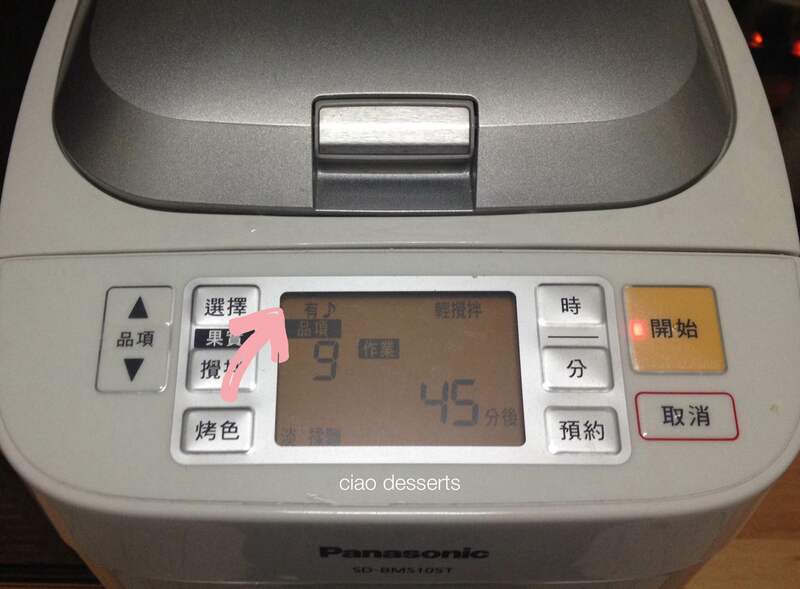 *Also note that these are instructions, settings and ingredient measurements for the Panasonic SD-BMS 105T model. You may need to adjust the measurements for your machine. 40 g frozen, unsalted butter, cut up into small cubes, to be added later. Ingredient Notes: One medium sized egg and one egg yolk was about 73 grams. Add in enough water to yield 140 grams of liquid. Beat the eggs and water with a fork or a whisk until frothy and well-combined. (Make sure that there are no stray bits of egg yolk floating around before dumping this into your bread machine). Step 2: Add in flour, water, sugar, salt, milk powder and beaten eggs to the baking pan. Step 3: Add the yeast into the dispenser. Step 4: Press Recipe option 9 on the bread machine’s control panel. Press the option for “add in” Make sure you have the musical note on your control panel’s screen. This means that the machine will alert you when to add in the additions (in this case the frozen butter) Also choose the option for “light crust.” The “45 mins” means that you will add in the frozen butter pieces 45 minutes later. Select the option for “light kneading.” This is not made very clear in the recipe, but Option 9 will go through about 45 minutes of mixing. During this step, all the ingredients will be mixed together, and the yeast will also be added from the dispenser. As you can see, the bread dough is a bit softer and more moist than the usual dough for basic white bread. Step 5: When the machine beeps, add in your frozen butter pieces. Press the Start button again. The butter will then be incorporated into the bread dough. This will take about 25 minutes. Aforementioned, the butter must be cut into small chunks and frozen to a rock-solid state. I soon found out why. The bread machine heats up quite a bit leading up to this step (to provide a nice toasty environment for the dough to rise) and if the butter isn’t frozen, it would be a melted mess before it makes it out of the dispenser into your bread dough. Step 7: The dough will now go through the rising and baking process (This will take about 2 hours in total) . At one point, about 25 minutes baking, the butter began heat up and smells a bit burned. This is what the bread looks like right out of the machine… I was a little bit dubious. It looked like it hadn’t risen properly, and the loaf seemed to be swimming in butter. However, curiosity got the best of me, and I tilted the bread out the pan right away, and cut a slice. The bread was deliciously buttery and soft in texture. Oh, it also smelled absolutely heavenly. 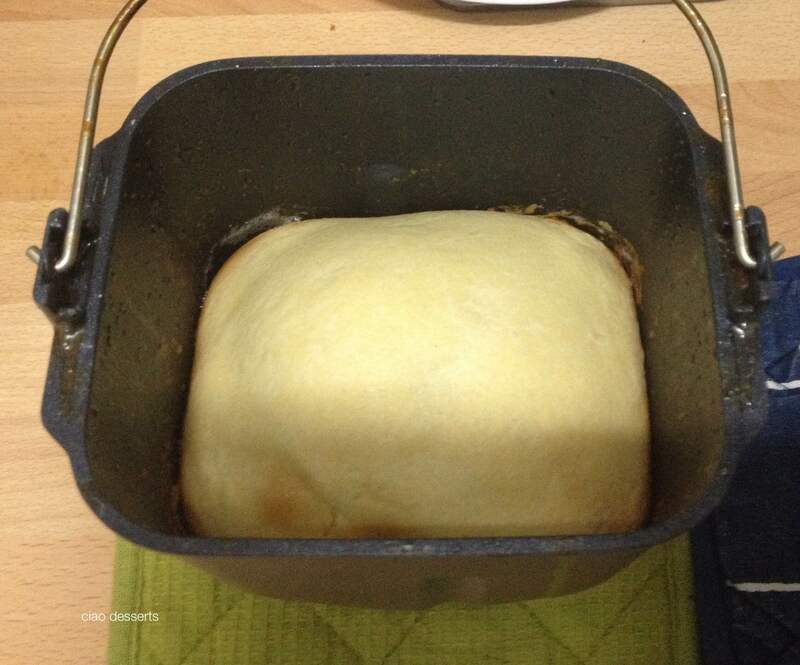 But the loaf seems a bit flat, and I suspected that the dough had not risen completely. 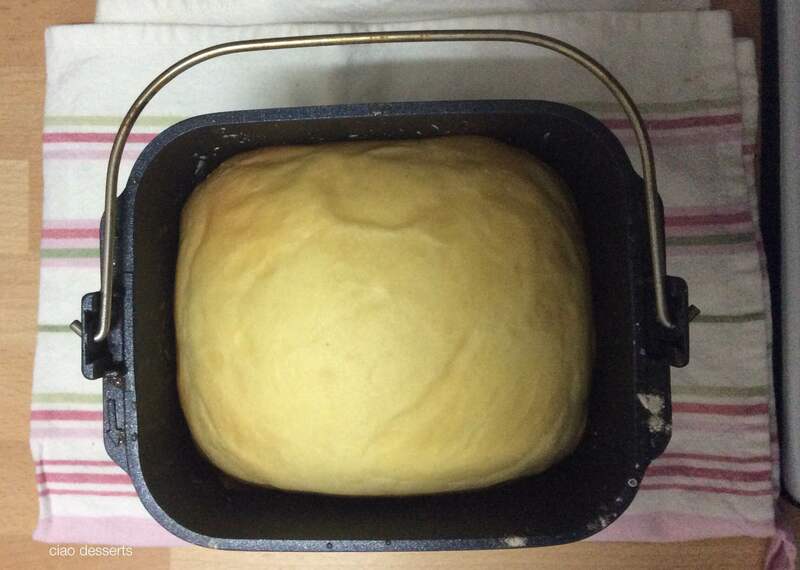 (Side note, I had also made a batch of pizza dough with the same packet of yeast, and it didn’t rise properly) So I’m guessing that it might be the yeast, or the fact that the temperature was a little bit high that day. The English manual did warn that the bread might not turn out as well if room temperatures were over 30F. Summers are hot and humid here in Taiwan, and temperatures were quite high in my kitchen that night. In addition, the recipe called for 170g all purpose flour and 30 g cake flour. I didn’t have any cake flour at the time, so I just used 200g of all purpose flour. Overall, the entire rising and baking process takes about three hours. This is definitely one of the more hands-on recipes for this bread machine and requires a bit more planning if you want to eat it at a specific time. I would recommend that you make it the night before for breakfast the next morning. The brioche is delicious toasted, and I imagine it would make some decadent French toast too! As you can see, this new brioche has a much better rise, and there all of the butter has been incorporated. This version was much softer and fluffier in texture. Similar to my last loaf, the smell of butter is absolutely tantalizing. I think next time I make this, I will also add in a bit more sugar. I’m glad that I gave this bread a second chance~ sometimes you just really need to go through a recipe a couple times before deciding its fate in your cooking repertoire. This brioche will definitely be incorporated into my regularly scheduled bread baking from now on. You can also read my English translation for a basic white bread recipe here. There is also a full review of my bread machine here. I would love to hear your experiences with this machine or similar models! I made the brioche according to your instructions tonight and it turned out beautifully!!! So buttery and delicious. Thanks for providing the awesome recipe!!! !